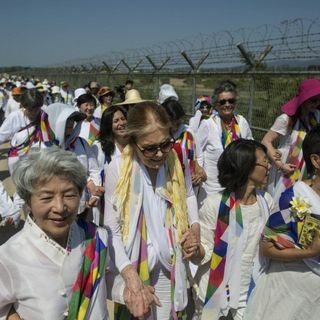 In May 2015, on the 70th anniversary of Korea’s national division, thirty international women peacemakers from around the world walked with thousands of North and South Korean women to call for an end to the Korean War, reunification of families and the inclusion of women’s leadership in the peace process. Christine Ahn, the founder of Women Cross the DMZ, Women De-Militarize the Zone, The Korea Policy Institute, The Global Campaign to Save Jeju Island, The Korea Peace Network and a ... See More co-organizer of the May, 2015 event joins host Andre Goulet to explore how she and others continue to work for peace on the peninsula in 2019. This conversation was recorded on January 25th, 2019.